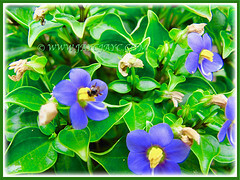 Exacum affine or Persian Violet is a seasonal bloomer with gorgeous violet-blue flowers. These blooms are wonderfully fragrant too. Definitely a plant to add some ‘perfume’ to your garden. Botanical Name: Exacum affine (syn. : Exacum socotranum, Exacum gracilipes). 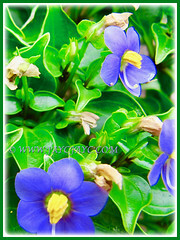 Common Names:Persian Violet, Exacum Persian Violet. Etymology: The genus name, Exacum is a variant of the Gallic name exacon for centaurium transferred to this genus. The specific epithet means related to or similar. Origin: Native to Socotra, part of Yemen, although popularly cultivated world wide. 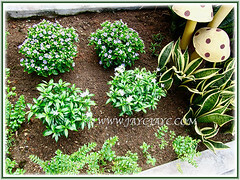 Plant type: An ornamental, herbaceous and perennial tropical plant. Nevertheless, it is usually planted as an annual in temperate regions. Features: Exacum affine is a species of the genus Exacum that comprises of about 70 species of flowering plants. 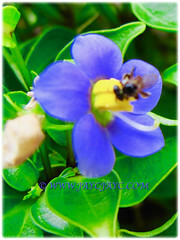 A small herbaceous biennial plant that is popularly grown for its captivating violet-blue to deep purple flowers that are studded with bright yellow centres. These fragrant flowers will densely cover the plant if grown under the proper cultural conditions. 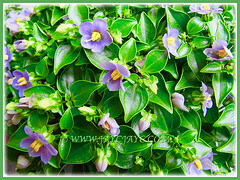 Culture (Care): Exacum affine or Persian Violet can be easily grown with minimum care. Light: Best with filtered sun or partial shade. It will not tolerate full sun that will scorch its foliage. Moisture: Moderate water needs. To little water will cause the flowers to fade quickly. Keep soil evenly moist but not soggy. 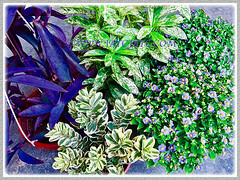 Soil: Best in African violet potting mix or peat-moss based potting mix. Others: Pinch off flowers after they fade to promote more blooms. If you leave the dried flowers on the plant, they will start to create seeds. Should this happen, it will shorten the life span of the plant. To avoid this, pop off the dead flower heads as soon as you notice them.Do not water too frequently as it may cause root rot which is the most common problem with this plant. It needs high humidity. Thus, use a humidifier or raise the humidity around by placing the pot on a tray of wet pebbles. You can even mist the foliage with room-temperature water. Feed once fortnightly with a balanced liquid fertilizer diluted by half. Generally free from pests or diseases. For subtropical and temperate regions: Hardiness: USDA Zone 10 – 12. 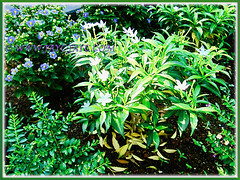 Exacum affine is an annual or short-lived perennial.It is suitable for permanent outdoor cultivation only in humid tropical and subtropical areas. Grown as a pot plant, this plant requires a well-drained, but moist potting mix. They flower in late spring to summer for several weeks. Blooming for an extended period but are very difficult to keep growing after flowering. Cutting can be taken successfully. You can also propagate the plant by its tiny seeds. Sow the seeds in winter or early spring on top of moist potting mix in a shallow pot. In USDA zones 10 to 12, it is normally used as a bedding plant or ground cover. Keep plant away from drafts. Average room temperature of 18-24°C is great. Propagation: Can be propagated by the tiny seeds that will germinate in 2-3 weeks. Alternatively, you can use cuttings. 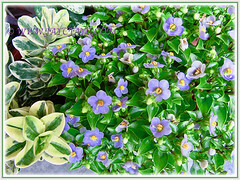 Usage: Exacum Persian Violet or Exacum affine with captivating violet-blue flowers will add a splash of colour and interest to the home when grown indoors or brighten your garden when planted outdoors. Excellent as a bedding plant or ground cover. Ideal as a container plant on a patio or deck. In Yemen, it is known to be used as a medicinal plant in traditional medicine.